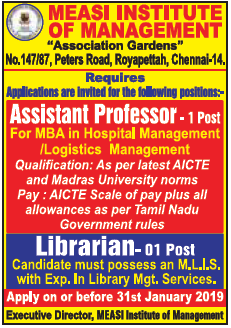 Measi Institute of Management, Chennai has advertised in THE HINDU newspaper for recruitment of Assistant Professor Plus Librarian jobs vacancies. Interested and eligible job aspirants are requested to apply on or before 31st January 2019. Check out further more details below. About College: MEASI INSTITUTE OF MANAGEMENT was selected and rewarded for the educational excellence in 2017 under the category of most promising business management institute in Chennai. The Award function was presided by dignitaries from Government and other fraternity including parliamentarians including former cricketer, Director National Cricket Academy Sandeep Patil.